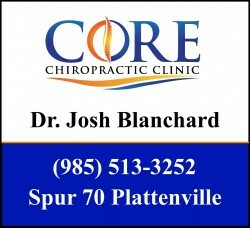 Dr. Josh Blanchard announces the opening of Core Chiropractic Clinic on Spur 70 in Napoleonville. Dr. Blanchard is originally from Plattenville. He attended St. Elizabeth School and Ascension Catholic. He earned his bachelors in Kinesiology from LSU and his doctorate of chiropractic from Life University in Marietta, GA.
At Core Chiropractic Clinic, their goal is to serve their patients and community with the highest quality care. The office offers chiropractic treatments and therapies to treat patient symptoms such as neck pain, low back pain, headaches, disc herniations, leg/arm tingling and more. Dr. Blanchard is also experienced working with kids whom suffer from ear infections, sleeping issues, colic, and reflux. The office accepts insurance and no medical doctor referral is needed. The office is open Tuesday and Friday 3:00pm – 6:00pm and Saturday 8:30am – 10:00am. If you would like more information about Core Chiropractic Clinic or would like to schedule an appointment, call (985) 513-3252 or visit www.corechiroclinic.com.